Excerpted from graf/AK, photography by Fraser Munro, Beatnik Publishing, 2012. For me, graf/AK is as much about the skill of Fraser Munro as it is about that of the featured graffiti artists and writers. Fraser is terribly modest about it, but I can see and appreciate the time and effort that went into capturing these brilliant images. It’s not a simple matter of holding up the camera, facing the wall and clicking. 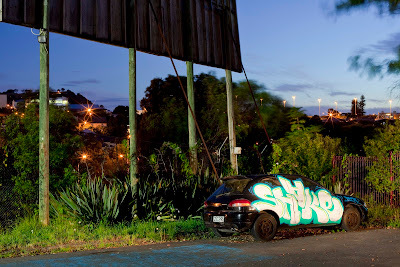 He has considered the light sources, time of day, composition, environment, colour and the messages in the work. 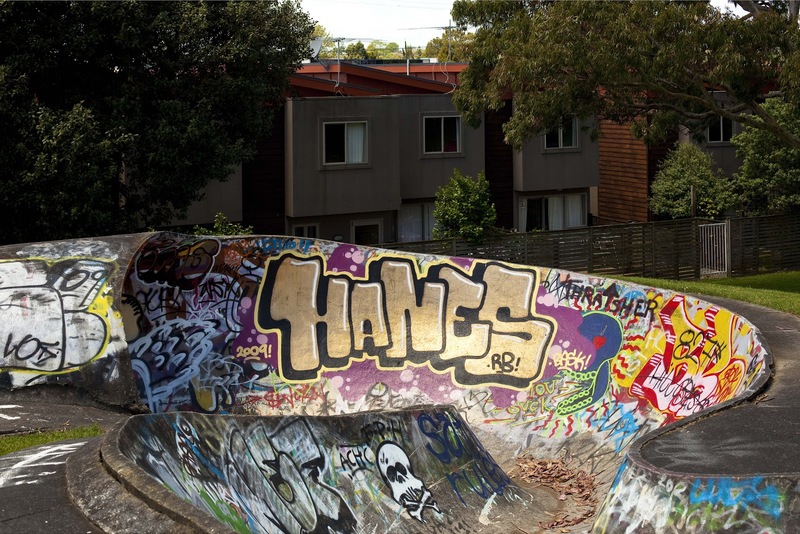 Where it makes sense to give the graffiti pieces their context, he opens up the space, widens the lens, and shows us their surroundings. When he wants us to concentrate on the devilish details, he closes in. By giving them context, Fraser has given the amazing vibrant artworks a story that leaves the viewer more curious and intrigued. Many Beatnik visitors have come into our studios, picked up Fraser’s project portfolio and become lost in a world of captured light and colour. 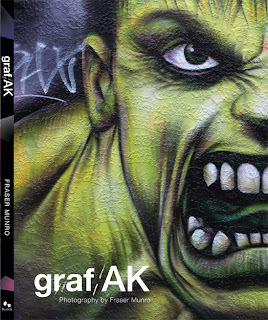 graf/AK is a book that reveals something new every time you sit down with it. First and foremost, graf/AK is a catalogue of admiration. 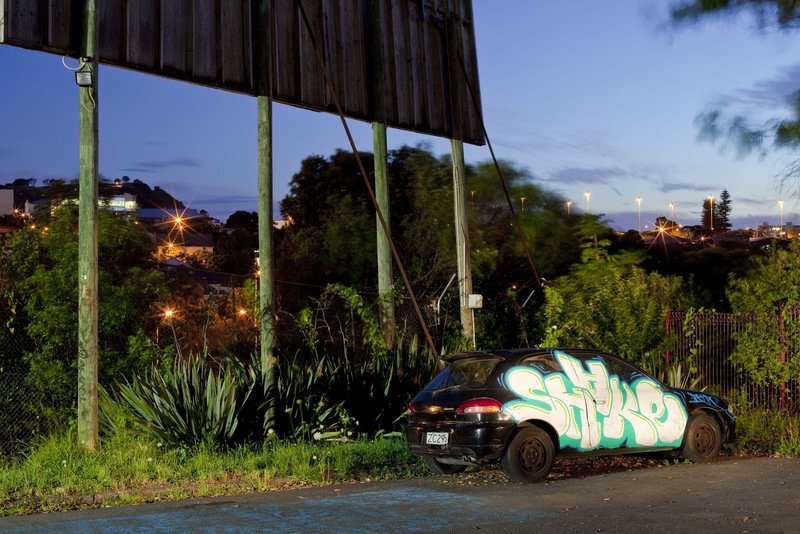 Fraser’s photography documents the constant evolution of Auckland’s world-renowned graffiti walls and their artists’ internationally-lauded innovative styles. Many of the artists whose names you see in this book are feted in Florida, New York and Los Angeles and further afield – and the photographs here show why. 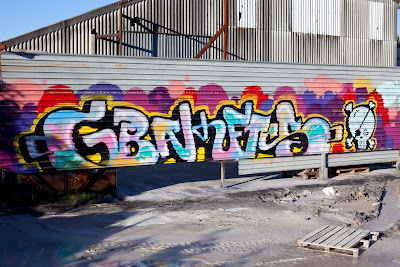 graf/AK is a celebration of the creativity Auckland has to offer and we’re grateful to Fraser for bringing this project to Beatnik, and proud to take it to the world. Thanks to all the clever people who have been involved in graf/AK. No book project is straight-forward and this one has been no exception. Special thanks to the team - George Mitchell, Ande Kuric, Blake Wood, Kitki Tong, Jenny Thompson and Janet McAllister - for the time and energy you have given to the publication and Beatnik. Thank you for the post Graham! We will be officially launching graf/AK on December 12th, 6 - 9pm at Beatnik (11 New North Road, Eden Terrace, Auckland). Please join us.